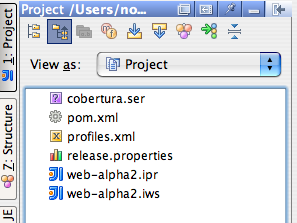 When there's a profiles.xml in the root of my project, IDEA starts but will not display anything (almost) in the project view (see attached snapshot file). I'm using #7523 and the problem persists, under Windows and OS X afaik. I'm not a Maven expert but my profiles.xml seems regular, at least it works with maven command line. Hi I ran into a similar problem: when one of the sub projects has multiple profiles and one of those profiles is activated, a clean install on the parent pom will ignore the activated profile and thus build the project as if none of the profiles were selected. I'm using the same version but on windows. Could you please attach sample poms and profiles files so that I could reproduce the problem? sorry for the late reply, something must has been wrong with my email client. and IDEA would have this weird behaviour. I've created relevant request in jira:http://www.jetbrains.net/jira/browse/IDEADEV-23199. I'm up to fix it by the next eap. The problem with xml you wrote is that it is not well formed. Profiles.xml file should contain element as a root (not the ]]>). I've added some error reporting in last eap (but not very user-friendly one - it just logs exceptions that could arise - but enough to track the root of the problems).